As the spaces we live and work in get smaller, the need for practical storage solutions is at an all-time high. Gone are the days of organising your belongings just to tuck them away in the garage or spare room, with the rise of designers and renovators providing major inspirations for all our DIY visions. Stylish storage is a growing trend that enables people to organise their home or office with their storage ‘on display’. 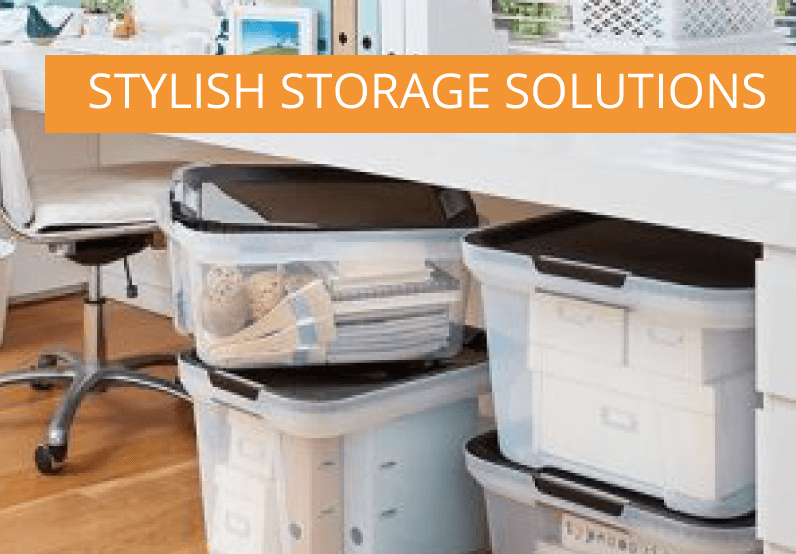 The look is achieved using sophisticated storage options and by ensuring containers and tubs are organised well to maximise overall room space. By following a few simple steps, stylish storage in your space doesn’t have to be out of reach. The first step to good organisation is not only getting rid of the items that you’ve been hoarding, but also the boxes and baskets no longer serving a purpose. Throw away storage that makes neat stacking difficult and instead, invest in a handful of good quality containers that are practical and specifically meet your storage requirements. Organise your containers by packing similar items together. Not only will it be it easier to find things this way, it will also look more aesthetically pleasing when they’re packed. Look for products that enable modular stacking, to help separate large and small items. The key to any good design is consistency. Purchase uniformly sized containers that won’t make stacking feel like a game of Tetris and ones that visibly suit the décor already in your space. Opting for white or clear containers guarantees design coherency and ensures your storage that doesn’t draw unwanted attention. Stack your larger containers on the bottom and your smaller containers on top to ensure they provide support to one another. Once you’ve packed your containers, instead of squeezing them tightly into a corner, try storing them on an open shelf with other decorative display items so they blend in. If you intend to use your storage containers to be on display with your décor items, invest in high quality containers rather than cheaper options. A good quality container should have high clarity plastic that imitates the look of glass, making it the perfect option to store your items on display. Our go-to storage option to achieve the stylish storage look is the Ultimate Tub. With 6 sizes to choose from, the Ultimate Tub didn’t get its name for no reason. The elegant tub amps up your storage game and compliments any space with its sleek high clarity finish and jam-packed features. Highlights include the tubs comfort touch grips, an easy push down lid and multi-directional 360-degree wheels that make moving filled boxes a breeze. The tubs ventilation ports also help air flow through to reduce mould and odours, so they are suitable for storing anything from clothing, linen, paperwork and all other treasured items. With these tips, you’ll be able to some add extra style to your home when using storage containers to organise your belongings.